Selective mutism (SM) is an anxiety disorder that renders children speechless in school and community situations, while their speaking is within normal limits in their homes (provided only the parents and siblings are present). Untreated, this condition prohibits children from participating in education settings in a typical manner, leaves their educators unable to accurately gauge their progress and may result in abnormal or stunted social relationships with peers. 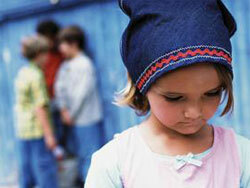 We treat both children and adolescents with SM, and like other disorders, treatment varies for each individual. Typically, we focus first on training the parents on the PCIT-SM skills that we have found to be very effective, and then provide live in-vivo coaching. Our goal is to help our parents learn these skills effectively, so that they can target verbalizations when they are alone with their child in the community. We have found that by providing live, in the moment feedback, our parents learn the skills quicker and more effectively. Throughout treatment, we systematically and gradually increase the difficulty of the task. For example, we start with the child and parent alone in the room and coach the parents first to help their child become verbal. Eventually, we begin to slowly “fade” ourselves into the office, first with the parent and the child, and then eventually with the child alone. Typically, after the first session, we will begin collaborating with the school to determine a school-based intervention. Given that most children with SM are most impaired in the school setting, we put a lot of our time and resources into collaborating with the school. Our collaboration usually includes a school training, consultation calls with the school, and in many instances, sessions that actually take place in the school setting. Treatment with children with SM requires flexibility and creativity. While some of our sessions take place in the office, the majority of our sessions may take place in the community. Our clinicians will go to the child’s school and home community to work with them in places where they struggle the most. SM treatment is an active process, and will include home practicing of skills outside the sessions. Our parents are extremely involved in treatment and will learn to be effective at helping their children verbalize in places where they are currently non-verbal.